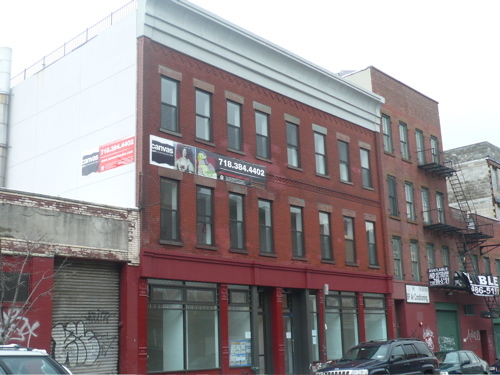 66 North 1st Street, the finished product. 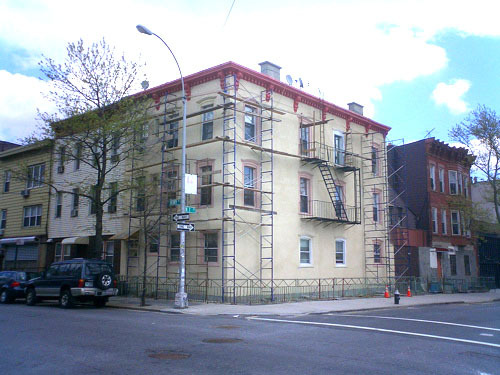 We've been watching the rehabilitation of 66 North 1st Street for a couple years now, with a mix of hope and trepidation. 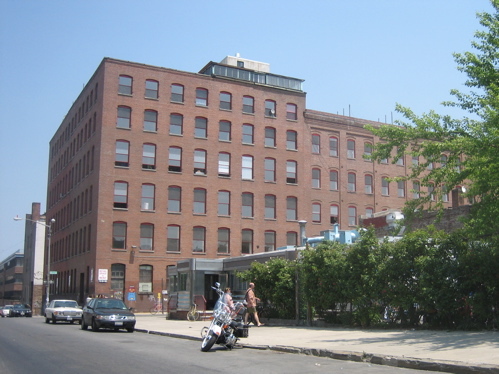 The building (between Kent and Wythe) started life as a three-story industrial building (most recently occupied by Newco Ironworks). 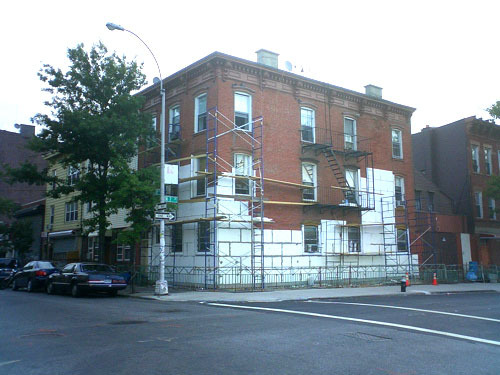 The three-story addition clearly has its tumorous qualities, but its also not just a box plopped on top of an old building. Yes, it overwhelms the base (hence the trepidation), but the setback and skewing of the footprint lessens the impact (hence the hope). 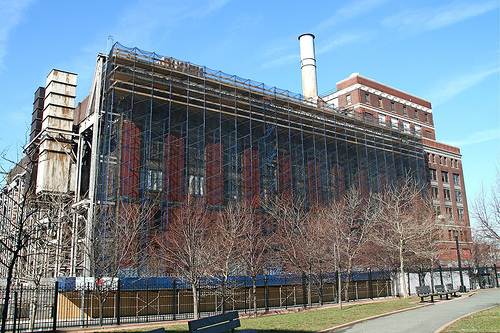 The restoration of the base building was done very well, so if the rest of the project proceeded with something approaching sensitivity, there was cause for hope. Its not going to be "Landmarks" quality, but it might be something. 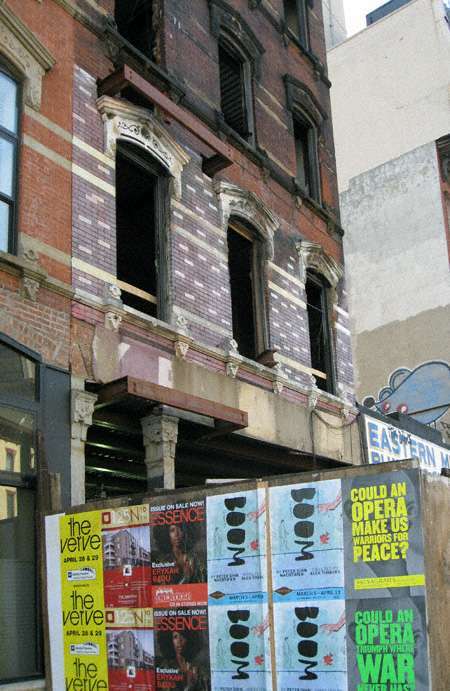 66 North 1st Street, April 2005. 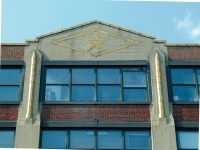 But God is in the details, and either the architect (Bob Scarano's workshop) or the developer was clearly not paying attention to the details. The first signs of true ham-fistedness were noted by Gowanus Lounge last November. 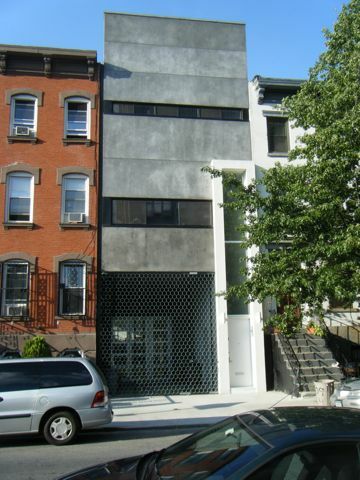 As Guskind noted then, the side wall detail completely obliterates the distinction between new and old. 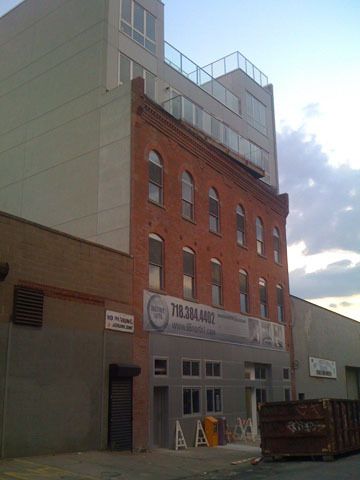 Instead of a dialog between the two, as at the front of the building, the addition just swallows up the base. Not a promising development. 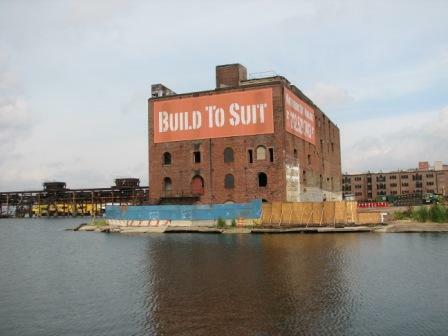 Now that the building is more or less complete, we thinks its time to declare the whole thing a failure. To be generous, maybe whoever designed the addition had nothing to do with the ground floor. But whoever designed the ground floor deserves to lose their license to design. The old base was nothing special, just a couple of drive in entries with roll down gates. The new base, though is a poorly executed applique of cheap aluminum panels, that completely ruins any chance this project had of coming off well design-wise. 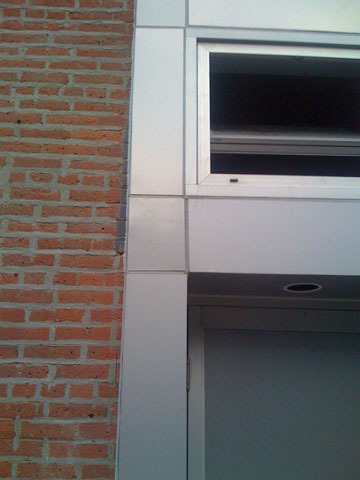 On top of that, the workmanship is completely atrocious, with misaligned panels and fat caulk joints. If this is any indication of the quality of workmanship on the project, it doesn't bode well for anyone buying one of the 21 units in the building. An interesting idea, killed by lack of design follow through and pathetic workmanship. Sometimes its better just to demolish a building. 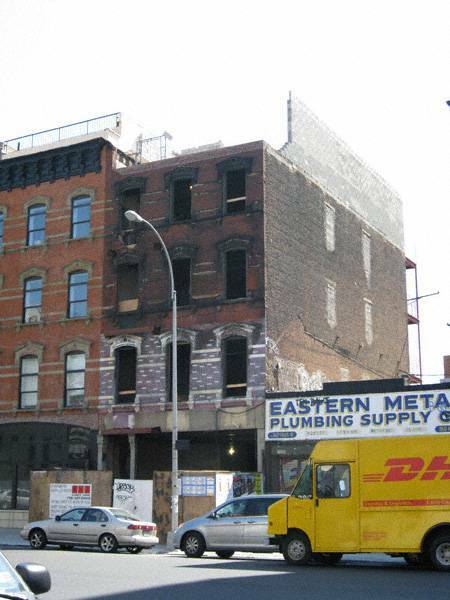 92 North 4th Street, before. 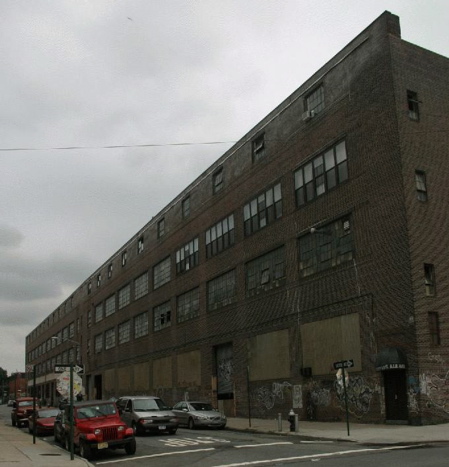 Granted, the loft building on North 4th between Berry and Wythe (now branded Steelworks Lofts) isn't going to win any beauty pageants. But we're a little unclear as to how recladding the top floor helps things in any way. Of course architect Gene Kaufman's current design is a far sight better than his original proposal. Justin Farrow has a slide show of lost buildings, most of which will be familiar to WPA readers. 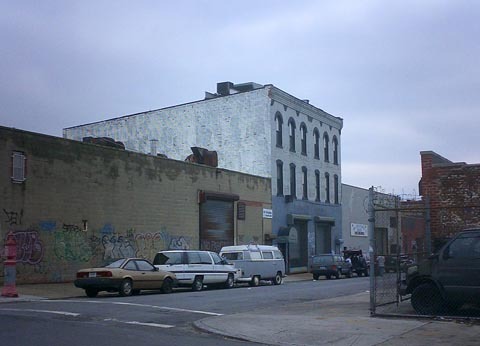 Many nice shots of Greenpoint Terminal Market (American Manufacturing) and of Hope Street. On the north side of North 9th Street between Wythe and Berry there is a lovely row of tiny houses, about 9 in all (originally there were 10). 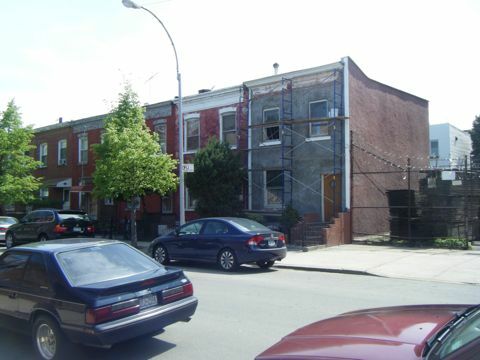 Raised on low basements, the two-story buildings are simple and small. They are constructed of brick with brick or stone segmental-arch lintels and brick cornices. By Northside standards, the buildings are quite old - they appear on land maps as early as 1869 and probably date to before the Civil War. They've survived for at least 140 years pretty much intact. 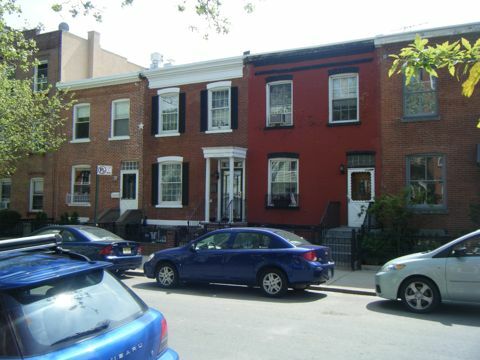 Some have been painted, some have been made fancier through the addition of porticos and porches. 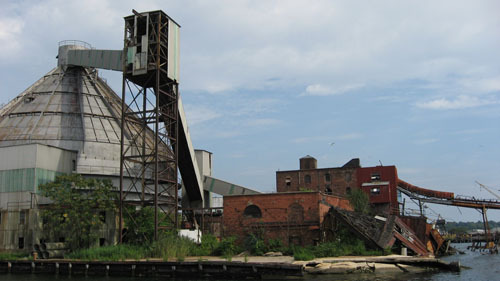 But for the most part, they have remained as simple brick buildings. Until now. 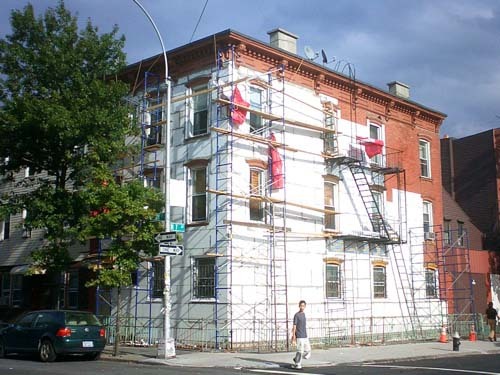 The westernmost building in the row (96 North 9th Street) is in the process of being "upgraded" with a new stucco finish. 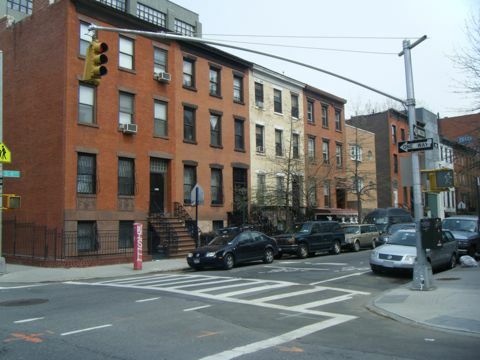 This is a treatment that has become ubiquitous in Greenpoint and Williamsburg in the past few years. It involves gluing styrofoam to the face of a building and then applying a very thin coat of cement stucco. By sculpting the styrofoam, wonderful (as in wonderfully tasteless) shapes can be achieved. The stucco can be tinted any color of the rainbow, and it usually is. In a neighborhood that has embraced every form of artificial siding ever invented, maybe its appropriate. But from the building's point of view, there is absolutely no reason for it. The stucco will not make the building last longer - certainly no longer than a decent pointing job would. It certainly doesn't make the building look better. It just makes the building look like something it shouldn't be. To say that we are disappointed in the leadership of CM David Yassky, who represents this school would be both an understatement and untrue. 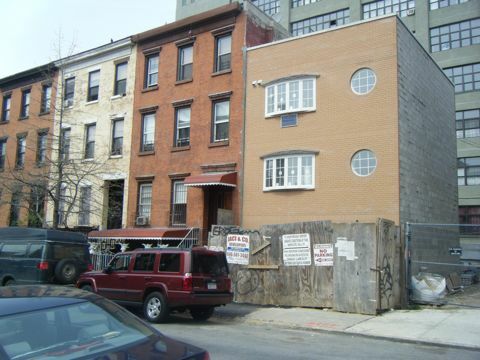 While Mr. Yassky represents the largest number of designated landmark properties in Brooklyn, over the years he has proven to be tone-deaf to preservation issues. 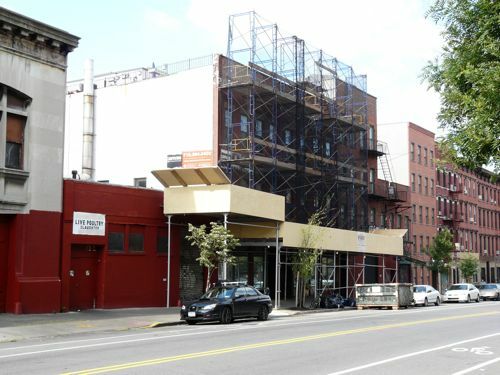 Although he has supported commuity-driven preservation efforts in Dumbo (both the designation of the historic district and opposing the Dock Street proposal), he has been absent from many preservation conversations in Brooklyn Heights, Park Slope and other parts of his district and either unhelpful or hostile to efforts in Williamsburg (such as 184 Kent Avenue, the Greenpoint-Williamsburg Rezoning & the Hecla Iron Works). 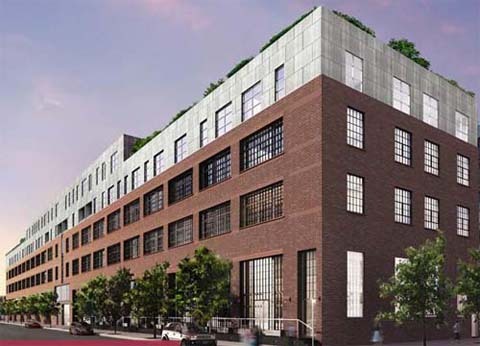 He has been of no help on the Admiral’s Row Houses (which he represents, not CM Letitia James) and as memory serves, he was absent on the debate about the Purchase Building.